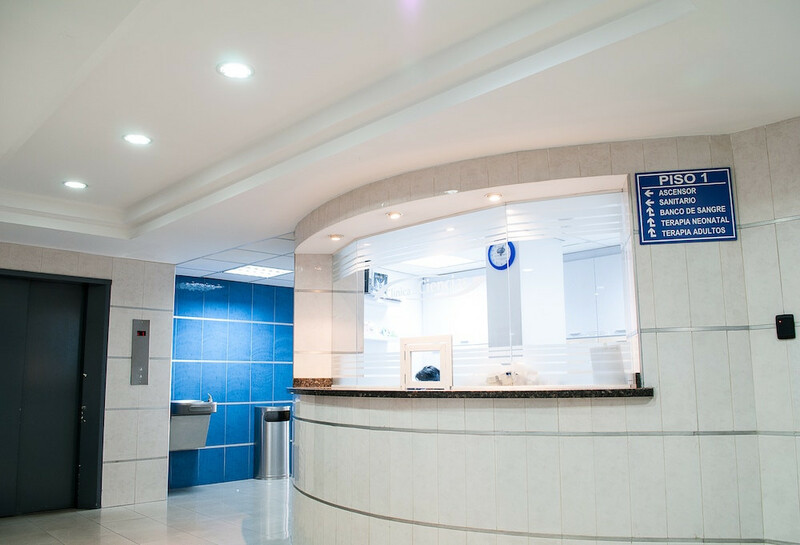 Developed unified campaigns that streamlined production, generated more from a budget stretched between 6 hospitals, and provided enough data for optimization to improve results. 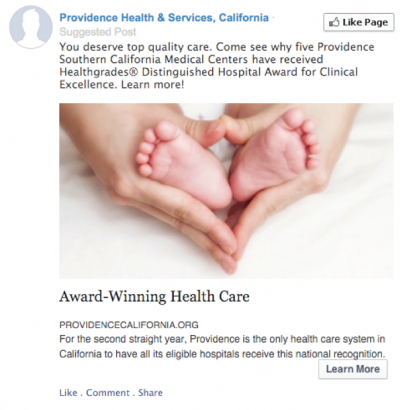 Providence California’s digital media was very fragmented, running as many as six different display campaigns each month with a limited budget, with no differentiation for different targeting. 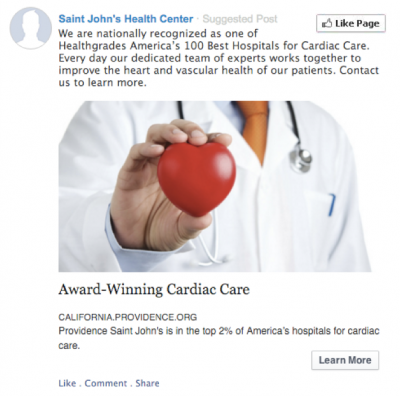 Their paid search campaigns were siloed by hospital and budgets stretched to cover every available service line. The stretched budget and quick turnaround never allowed for much optimization on either channel. 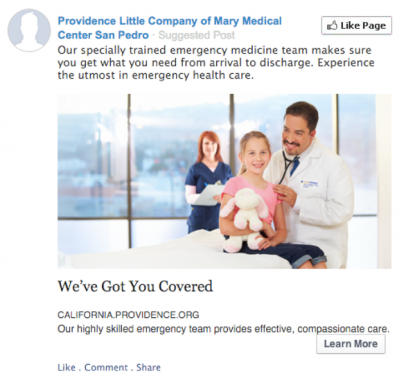 Providence California consisted of six Los Angeles-area hospitals, all with their own marketing needs. Previous campaigns had each hospital running its own creative to its own landing page within a very limited geography so as not to overlap other hospitals. Paid search campaigns were all siloed, resulting hospitals potentially competing for the same keywords in shared geographies. The fragmentation also led to a lot of small, disparate data sets causing trends and insights to often go undiscovered and made testing impossible. Need to streamline your media efforts? 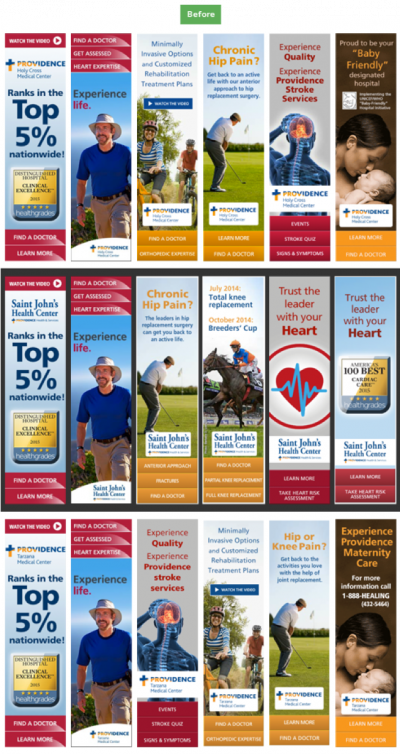 Developed cross-channel ad campaigns focusing on service lines provided by all hospitals and affecting the largest groups of people so that banner, social media, and paid search creative could deliver consistent ads that applied to all 6 hospitals. Upon click, the user would be taken to a landing page for the closest hospital to their current location. 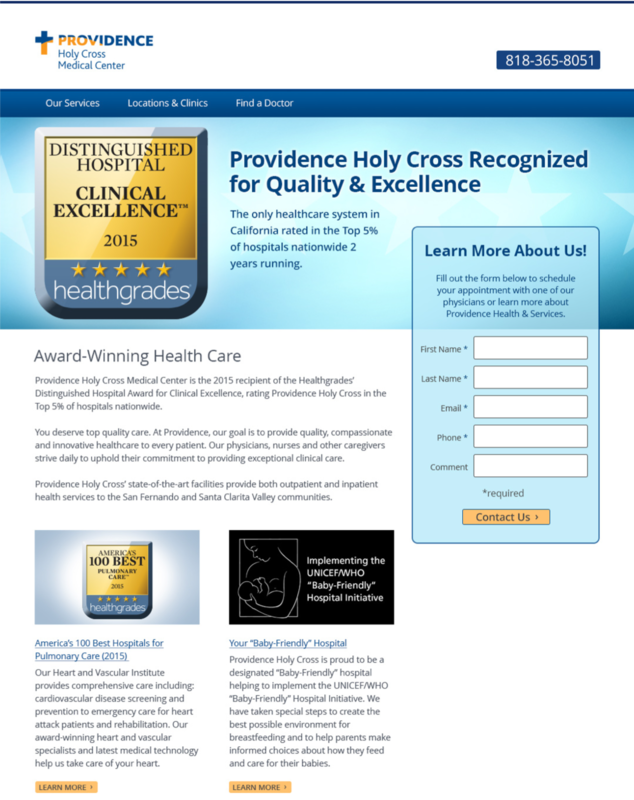 Each landing page was custom to the hospital so they could highlight specialities, certifications, and other features unique to each location. Similarly we reduced the number of campaigns within paid search campaigns so that we could do more with a limited budget. By aggressively managing bids so that we allowed room in the budget to reach high-intent long-tail keywords instead of overpaying for broader keywords, we were able to drastically increase conversion rates. We added custom conversion actions within Google Analytics for more accurate tracking, as well as call tracking since so many users were more likely to call a location than fill out a form. By combining previously siloed campaign and changing our media buying strategy, we reduced the cost per impression and expanded geography resulting in more evenly distributed impressions across the 6 hospitals, larger reach, and more clicks for the same budget. With a consolidated data set, we were able to make more effective optimizations over time, driving a higher and higher conversion rate. Need to get more out of your media spend?